The Nemo Tenshi four-season tent sleeps two. 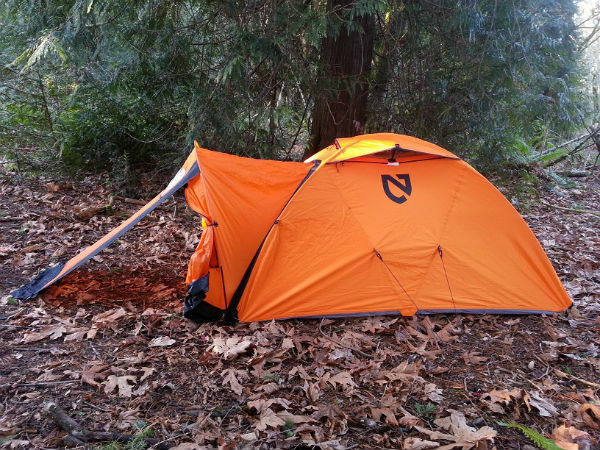 It is an all-mountain tent that rivals the competition, a tent worth a serious look. As with any piece of gear there are trade offs. The Nemo Tenshi comes with all its components in a roll-up style stuff sack. 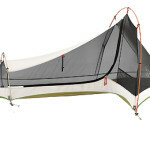 The tent, vestibule and condensation curtain are folded up and tucked into one compartment. The stakes and guy lines have another segregated compartment, and the poles have their own segregated compartment, too. The stuff sack rolls up and clips together for neat storage and transport, which is clever but adds weight. The initial setup went smoothly. The Nemo Tenshi is essentially pitched from the inside. This takes a little practice, but once it is figured out it allows you to crawl inside escaping the brunt of the elements to erect your shelter. A small issue I encountered was that the poles need to be inserted into little buttons at each interior corner of the tent. They are small, so in the dark and with inclement weather, they are a bit fiddly. 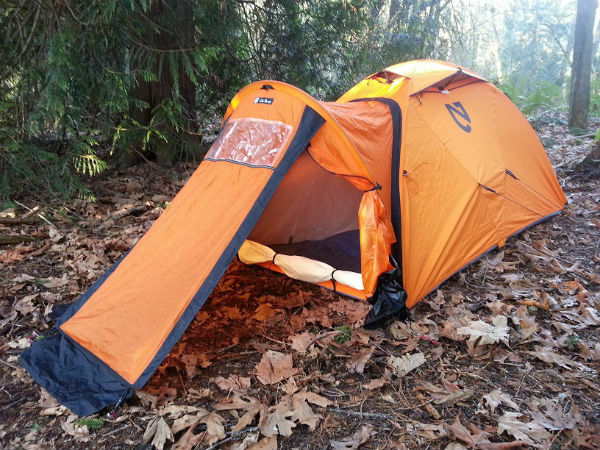 Once fitted onto the buttons, the tent goes up fast and it starts doing its job as a shelter. Next, adding the vestibule possibly takes more time to attach than erecting the tent itself, again the tent goes up fast. The vestibule requires a pole, which is slid into a sleeve sewn into the vestibule. The vestibule is then zipped to the tent, which is surprisingly easy even with cold fingers. 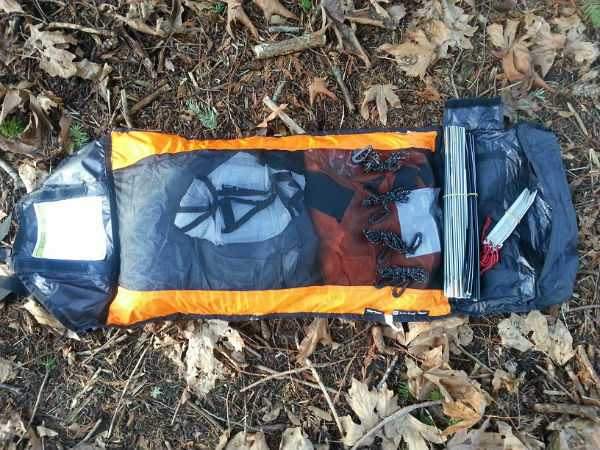 After staking it out, the vestibule provides 10 sq ft of sheltered space for cooking and/or gear storage. A nice feature is that the vestibule can be left out to reduce weight. The Tenshi shell fabric is constructed with 40D OSMO. A proprietary fabric which Nemo says is a “high tenacity ripstop polyester that is highly breathable.” The removable condensation curtain, which must be hung on the door end of the tent, did a good job of containing breathing moisture and the vent above allowed the moisture infused air to escape, thus minimizing interior frost or moisture build up. With this system in place, both occupants are required to sleep with their heads in the same direction which is towards the door. 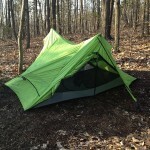 I found the tent to be less prone to condensation than other single-wall tents I have used. Sorry, but I was not willing to test the rip stop ability of the tent. The floor is constructed with 70D PU Nylon. The vestibule is constructed from 30D PU Nylon. The walls have a steep pitch to the peak height of 42”. 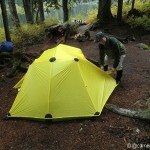 The Tenshi is easy to sit up inside, but isn’t an overly roomy tent. However, the interior shape does allow 2 adults to be upright without being to cramped. The steep side walls help the tent shed snow buildup. But this limits the wind deflection. Mother nature did not bless me with any sever wind, but we did have some gusts estimated up to 30kts. The anchor point system held strong and stabilized the tent. I am confident that the tent would withstand much stronger winds than it was subjected to. Sturdy design that withstands wind and snow very well. Needs seam seal prior to first use to make fully waterproof. Narrow foot print limits floor space to bring gear in. Stuff sack, while clever for organization, adds more bulk and weight than needed. Over all the Nemo Tenshi is a well-built and a cleverly designed tent. The materials used are top notch and the craftsmanship is an A+. It inspires confidence for use as a shelter in an alpine setting. If inclement weather should set in, my first concern would not be this tent. I am happy to add it to my gear and look forward to many years of faithful service. Leaving the stuff sack one can get the weight down to 5.5lbs. 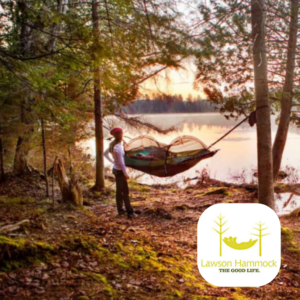 Garron’s father instilled a love of the outdoors, and basic camping etiquette and skills into him from an early age through frequent camping trips with the family. For his fifteenth Christmas he was given a backpack and has been backpacking ever since. His experience is primarily California-based including the Sierra Nevada, Joshua Tree, Big Sur, Baja, and the southwest desert, but he has also camped in 20 other states. He considers himself a student of Tom Brown Jr., who teaches Apache practices and culture. Garron is also an avid hiker, runner, tracker, hunter, kayaker, and passionate student of all things outdoors.